I love pizza. 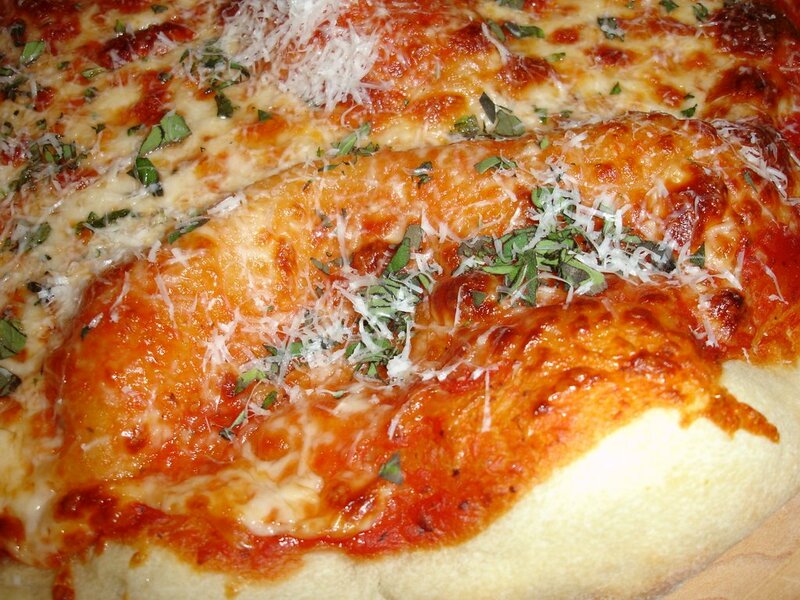 Thin, crispy/chewy pizza. 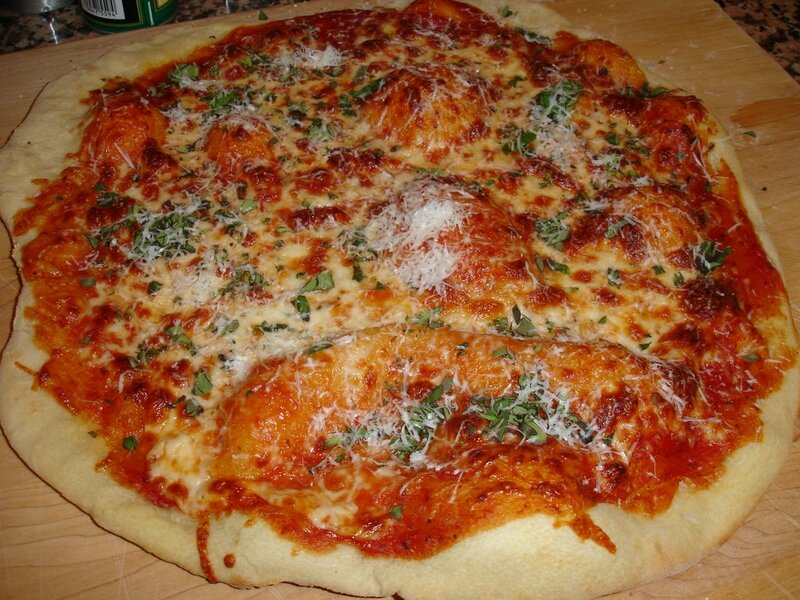 What's not to like about dough, tomato sauce, cheese and herbs? I totally get why pizza is so popular- there are so many variations that there's something for everyone. I, personally, prefer the thin crust with the crispy edge and chewy center lightly topped with a good tomato sauce and sprinkled with cheese + some fresh herbs. 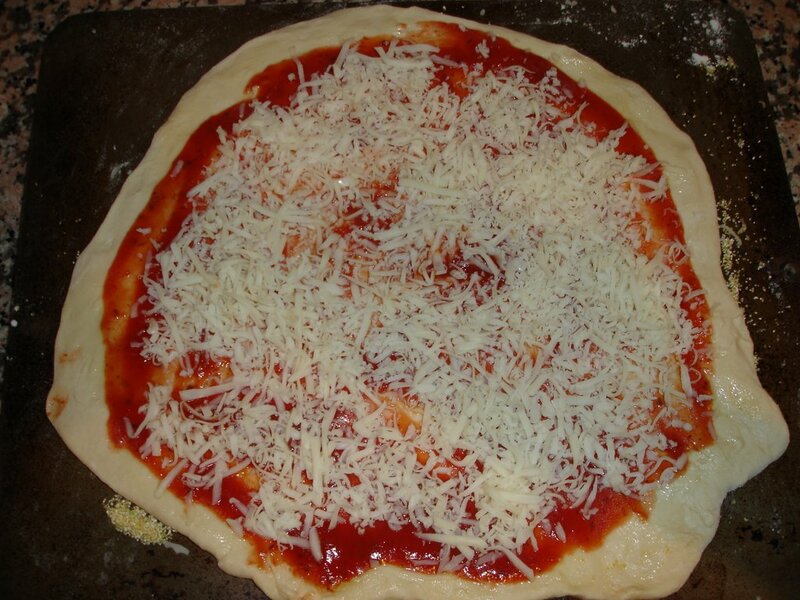 Although one of my goals is to make the perfect, handmade pizza crust, I don't always have the time to experiment. My first attempt wasn't bad but it also wasn't great for all the time I spent on it. 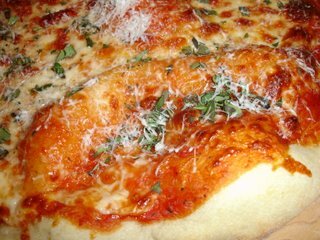 I do plan to continue my quest for the perfect homemade crust, but in the meantime I think I found the best alternative (which is actually waaay better than my first crust) for a nice, homemade-style crust in a hurry. I can't believe I didn't discover it sooner. After all, it is created by the guy who's been there for me over the years- the one who always comes up with creative and delicious ideas but knows that I don't want to spend a fortune. Yup, it's that guy again. Joe. Trader Joe. Trader Joe's Pizza Dough is sold in the refrigerated section and comes in a plastic bag. It comes in plain, whole wheat and herb flavors- I bought the plain. At 99 cents, you can't beat it. After letting the dough rest at room temperature for about an hour, I just plopped it onto my well-floured board and started rolling. It handled SO easily and I had my round pizza shape in no time flat. I lightly brushed the dough with olive oil and smeared it with some Trader Joe's pizza sauce (again, no time to home make but this one was really, really good. That Joe! He can do no wrong!). After giving it a generous sprinkling of grated mozzarella, my pizza was ready to be put onto the pizza stone in the 500 degree oven. Just 10 short minutes later, the pizza was bubbling in all the right places so I took it out, grated some pecorino Romano on top and finished it off with a shower of fresh oregano. My sister and I dug in and both agreed- TJ's is Da Man. I definitely want to one day make a crust as good as TJ's, but I have to admit, being able to buy such a great product that requires almost no time (and no money!) makes it difficult to stay motivated. On a completely different note- I recently made some vegan cookies. No no, I am far from being vegan but I love to bake for my coworkers, and one of them is vegan. She's one of the nicest people and I feel badly that she can't eat most of the baked goods I bring. 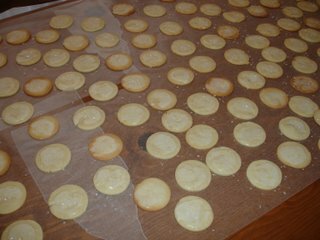 I made a variation on Vanilla Spritz Cookies from Sinfully Vegan by Lois Dieterly. I've had this book for awhile and I must say- every single thing I've made from it has been absolutely delicious. Personally, I find that a lot of vegan desserts taste the same- they tend to be heavy, and most are a variation on an oat/date/raisin theme, or a date/chocolate one. I purposely chose these cookies because you honestly would not think they were vegan at all. Crisp, buttery and light, they simply taste like a vanilla butter cookie should. To make them a bit more dressed up, I made a simple icing from lemon juice and confectioner's sugar, then topped that with some sparkling sugar crystals. Even my coworkers who normally wrinkle their noses at vegan sweets were asking for seconds and thirds. 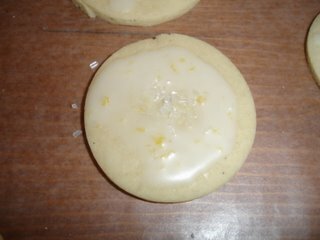 The lemon icing really complimented the vanilla in the little cookies. Preheat oven to 400. Cream butter, shortening and sugar together. In a small cup, combine egg replacement powder with the water and and all that, the almond milk and vanilla seeds to the butter mixture and stir to combine. Mix flour and baking powder in a bowl and add slowly to butter mixture. If batter is too sticky, add more flour until it forms a soft ball. Form dough into 2 balls, flatten into discs and wrap with plastic wrap. Refrigerate for an hour. Take sections of the chilled dough, roll out to 1/4 inch thickness on a well-floured board and cut with cookie cutters or with a knife. Place on baking sheet and bake for 8-10 minutes, depending on size. Combine until you reach desired thickness. Add more lemon juice to thin, more sugar to thicken. Once cookies have cooled, drizzle each with the icing and quickly sprinkle with sparkling sugar. Let cookies sit at room temperature until the icing has hardened. Store at room temperature in airtight containers.